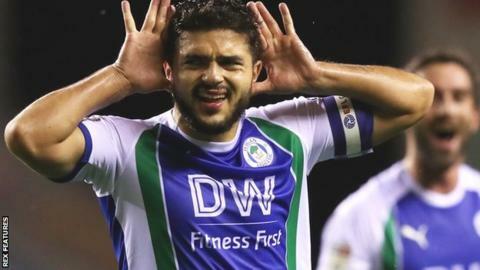 Wigan's decision to appeal against Sam Morsy's red card paid dividends as his goal set the Latics on the way to victory over Hull. Morsy was sent off in Saturday's defeat at Brentford but the dismissal was rescinded on appeal. The Egypt international gave Wigan the lead in the 21st minute with a low long-range strike before Josh Windass headed in a second from a Lee Evans cross. Jarrod Bowen pulled one back for the visitors with a calm finish to halve Hull's deficit to 2-1 at the break. Former Wigan striker Nouha Dicko had a great chance to level but fired straight at Latics goalkeeper Christian Walton, before Antonee Robinson and Michael Jacobs forced fine saves from Tigers goalkeeper David Marshall as the the home side finished strongly. Paul Cook's men have claimed 10 points from their four games at the DW Stadium so far this season and are level on points with sixth-placed Aston Villa. Last season's League One champions were ultimately worthy winners against a Hull side who have lost five of their eight league games this campaign. They visit Reading on Saturday, while Wigan are back in action against Bristol City on Friday night. "Hull probably started the better of the two sides, gave it to us for the first ten minutes and our lack of confidence from the weekend was exposed a bit. "But we ground out a foothold in the game, and from there we grew into the game. "I think the timing of their goal was a bit of a kick in the teeth for us, and checked us a little bit. "But that's the Championship. It's a tough league, and we just have to look at trying to manage games even better than we have been doing." "We could have scored three or four goals in the first 20 minutes and the game could have been out of sight but as it was that didn't happen. "We started the second half brightly and we huffed and we puffed but we've not done enough in terms of quality in the penalty area. "I'd like to think our starting line up was strong in an attacking sense. "I see potentially a very strong group of players who can do well. This was a game we could have gone on and won and we haven't done." Match ends, Wigan Athletic 2, Hull City 1. Second Half ends, Wigan Athletic 2, Hull City 1. Corner, Wigan Athletic. Conceded by David Marshall. Attempt saved. Michael Jacobs (Wigan Athletic) right footed shot from the right side of the box is saved in the top right corner. Assisted by Kal Naismith. Attempt missed. Lee Evans (Wigan Athletic) left footed shot from outside the box is too high. Assisted by Nick Powell. Substitution, Hull City. Evandro replaces Jordy de Wijs. Attempt missed. Cheyenne Dunkley (Wigan Athletic) header from the centre of the box misses to the left. Assisted by Lee Evans with a cross following a corner. Corner, Wigan Athletic. Conceded by Stephen Kingsley. Substitution, Wigan Athletic. Kal Naismith replaces Josh Windass. Corner, Wigan Athletic. Conceded by Jordy de Wijs. Attempt missed. Lee Evans (Wigan Athletic) right footed shot from the centre of the box misses to the left. Assisted by Reece James. Attempt saved. Antonee Robinson (Wigan Athletic) left footed shot from the left side of the box is saved in the centre of the goal. Assisted by Michael Jacobs. Substitution, Hull City. Kamil Grosicki replaces Kevin Stewart. Corner, Hull City. Conceded by Cheyenne Dunkley. Attempt blocked. Fraizer Campbell (Hull City) header from the centre of the box is blocked. Assisted by Eric Lichaj with a cross. Attempt saved. Michael Jacobs (Wigan Athletic) header from a difficult angle on the left is saved in the bottom left corner. Attempt missed. Sam Morsy (Wigan Athletic) right footed shot from outside the box is high and wide to the left. Assisted by Reece James. Substitution, Wigan Athletic. Darron Gibson replaces William Grigg.